“My Soul looks back—all the way back and wonders . 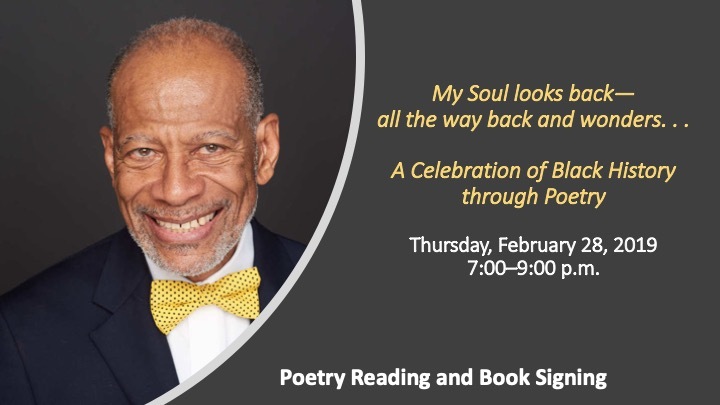 . .
Dr. Lonnell Johnson will offer a multimedia presentation where he shares his personal connection with Black History with a sampling of African-American poets who have impacted his writing. He also will be signing copies of his recently published book, Embracing Your Life Sentence: How to Turn Life’s Greatest Tragedies into Your Greatest Triumphs, following the reading (available at Amazon). With a B.S. degree in Pharmacy from Purdue University, Lonnell Johnson was drafted into the Army in 1967 and served as pharmacy instructor at Fort Sam Houston, Texas. This experience introduced him to the joys of classroom teaching, eventually leading to a Master’s degree in English from Emporia State University and a Ph.D. in English from Indiana University. For more than forty years, he has taught English on the university level in Kansas, Indiana, North Carolina, and Ohio. In addition has worked as a hospital pharmacist, editor, administrator, director of public relations, and information analyst. As a writer, he has published articles on a variety of subjects, such as biblical research and African-American literature. In 2005 he retired as Professor of English at Otterbein University in Westerville, OH. In addition he has authored three collections of poetry: Ears Near to the Lips of God; Sacred Jazz: Music, Mood and Mind and Stone upon Stone: Psalms of Remembrance as well as the personal narrative, Watch, Fight and Pray: My Personal Three-fold Strategy to Combat Prostate Cancer, a prelude to Embracing Your Life Sentence: How to Turn Life’s Greatest Tragedies into Your Greatest Triumphs which also includes original poetry. Currently, he facilitates courses in written and oral communication and general education at Carolina College of Biblical Studies where he serves as a professor. Dr. Johnson continues to explore ways to enhance his communication skills as an author, teacher, and motivational speaker. Is this for students only or may the public come? It is open to the public. We would love for you to join us that evening.